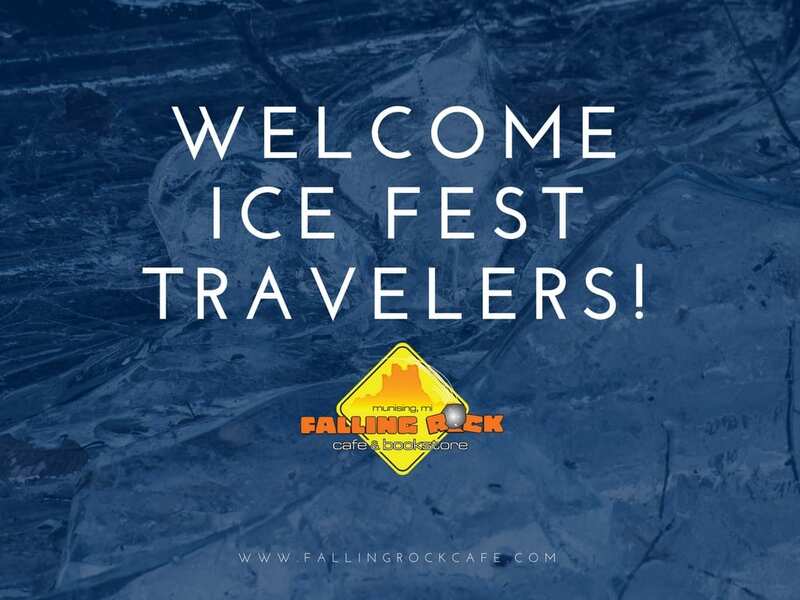 Welcome Michigan Upper Peninsula Ice Fest travelers! We’ve got a three-day weekend of frozen fun coming up, and The Falling Rock is planning on taking full advantage of the extra day with extended hours and special events at the café and bookstore! There is so much to do in the U.P. this time of year. Whether you’re in town for the Michigan Ice Fest, the UP200 Sled Dog Races, the Tahquamenon Snowshoe Race, or a long holiday weekend, you are sure to find something to do in and around Munising! While you’re here, we hope you’ll take a break from the cold air to warm up with us at the Falling Rock with a toasty warm latte, or cup of hot cocoa by the fire. Enjoy a special book presentation and signing by author David Pagel, a night of live music or trivia, or spend some time in our gallery and bookstore to appreciate the Michigan made art and browse our selection of regional books. We also have a full menu with specialty items and gluten free, dairy free, and vegan options daily. Thank you for visiting the wonderful wilderness of the Michigan Upper Peninsula! We hope you’re able to explore all the wonderful things our area has to offer.